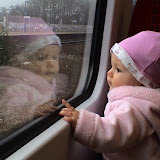 When Charlotte was 9 months old we travelled from Wellington, NZ, to London, UK, without a stop-over. We did great and had an amazing time. I’m a big traveller now. I flew all the way to England and I’ve been to the big City of London! I went on holiday to Falmouth, Cornwall with Grandma & Grandad Aspinall, Aunty Claire and of course my Mummy and Daddy! My Great Grandma comes to visit me and we go to Marwell Zoo. I was Christened on 2 May 2004 and lots of people came to share my special day. I’m here up north in the land of the Red Rose. Lancashire La La La.